Rack & Soul is a very good place to get yourself some pretty authentic southern cooking here in New York City. I’ve reviewed it on Yelp. Let’s assume that they’re referring to a human child here instead of a goat. Let’s grant them that. Laminated street poetry, or weird political statement? There is a lot of scaffolding in New York City. Its everywhere. For bike riders, like me, scaffolding is often a very convenient form of bike-rack. So you often see bikes chained to scaffolding. 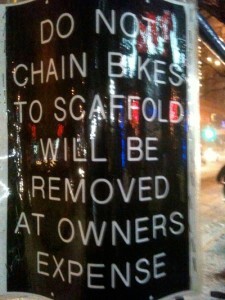 And you also see signs telling you not to chain your bike to scaffolding. But what’s up with this one? One presumes that this is telling you not to chain your bike to this scaffold. But there’s a reason for the existence of punctuation. Although this sign is, I must admit, relatively clear, line breaks are not really punctuation (Or are they? Argument anyone? 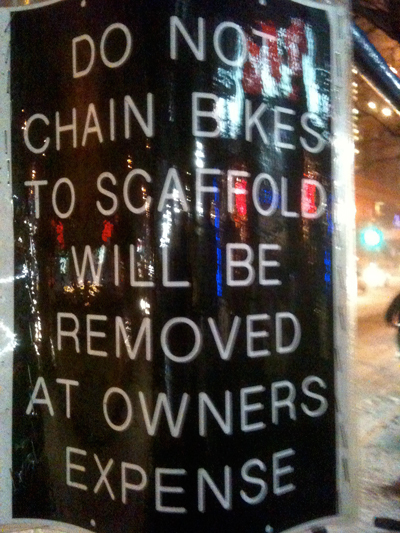 ), so technically: “DO NOT CHAIN BIKES TO SCAFFOLD WILL BE REMOVED AT OWNERS EXPENSE” is like the title to an art installation or some kind of neo-haiku. There is something wrong with chaining bikes in general. It is an anti-bike chaining statement. The owner of this scaffolding is going to remove this scaffolding at their own expense. I live a few blocks from NewYork-Presbyterian Hospital. This is a huge complex that is essentially two ivy-league medical schools (Columbia and Cornell) and a cluster of Hospital units. It is considered one of the most comprehensive university hospitals in the world, and is currently the largest private employer in New York City. People like Malcolm X, Richard Nixon and Jim Henson died there. It’s where Sunny von Bülow “vegged” out. NYPH has a palpable demographic impact on this area of the city. If I walk south from my apartment, I see people in scrubs. And it feels less like I live in the Dominican Republic. I’ve always been a bit ambivalent about this. The NYPH vibe is a bit snotty and “white.” I like the fact that Dominican political candidates come to my hood to campaign for elections that are happening on the island. Fort Washington Ave, cuts right through NYPH. So there is a stretch of it where you are basically in the Hospital. One of my options for bike routes down town takes me through that stretch and from time to time I see things that are poetically potent. There was one a few years back that has etched itself in my mind: There’s a small courtyard/garden at one point. Sitting on a bench I saw a young doctor talking very quietly and carefully to a man in a robe with his head in his one remaining hand. The evident struggle in this man to find a way to keep going after the amputation of his arm was shattering. And the struggle in this young doctor to find a way to cut through the futility of words…. It was just a moment, but I can’t shake it. Of course it might have been nothing. It might have been a life-long amputee with the flu listening to his son explain why he’s quitting medical school. But the image stuck. Manhattan Canyon is a short film by my friend Greg King. It’s up on the IFC website. I’m posting about it because, aside from it being both brilliant and beautiful, it relates to my Walking Broadway project of a while back. It gets at something about the large scale patterning of New York, that I’m fascinated by. Greg did the video work on SITI Company’s Hotel Cassiopeia, and like Joseph Cornell, the subject of that play, he has a relationship to both New York City and beauty that I am always deeply moved by. Greg is an artist with whom I have a certain degree of intimacy; The largest object in my living room is a painting by Greg. I see it every day I’m here in New York. It is a work of art that I live with. I think it’s important to live with art. To allow it to permeate one’s daily routine. Alter how you go about your business. Not as background. Decoration. Some sort of conspicuous bourgeoisie status badge. When people come to visit the apartment, I often take them around to show them the Paul Jenkins watercolor, the Robert Wilson charcoal, the Harvey Wang photo, the Jan Sawka Beckett posters, etc. Not because I want to show off (I hope). But because I want to introduce them to the pieces of art I live with. I’ve never been one to understand how one can read a great book, see a great movie, listen to a great piece of music, see a great production just once. It’s like meeting a good friend once. So here’s a link to Manhattan Canyon. The IFC site is a bit obnoxious but the film is worth it. I’ve been back in NYC for a few days now, watching the country try to figure out if it’s panicking, hopeful or just normal. Stories about those “Thank you Sarah Palin” (I used the name) videos. Stories about people who used to contribute money to food kitchens in the DC area, showing up for food. Bizarre discussions about how the new administration is going to be for comedians (now THATS a slow news day). All this in the context for me of returning to the Big City, during the holidays. A time when the romance of this place is hard to miss. I sat next to a woman on the flight from Atlanta who was visiting the city for the first time. She was older (60s? ), from Tennessee, and was traveling with her family. They had no relatives or friends in the city, and although this was her first time, her children make the trip almost every year. The focal point was the Macy’s parade to kick off a weekend of shopping. Not that I would want to judge, but it didn’t seem like these people were particularly well off. Somewhere in the vast white middle class at best. I was oddly moved, and as much as I find the commercialization of the NYC brand distasteful (that new “Go [heart] your own city” shirt is great), as a resident of the city that this nice old lady was visiting, I couldn’t help but feel like we had company. When we landed, I didn’t make a big deal of it, but I welcomed her, and wished her a pleasant time in our city. I’ve been saying, ever since the economic (insert word. Suggestions: Downturn. Collapse. Catastrophe. Melt-down. Apocalypse. Correction. Comeuppance. Whoopee-cushion. From-hell’s-heart-I-stab-at-thee. Elegant-demonstration-that-Reagan-was-wrong. Buddy-could-you-spare-a-dime. etc), “It’s a good time to not have anything.” The idea being that those of us who didn’t have millions couldn’t lose them if we tried. There actually is a practical advantage, psychologically, to having very little to lose. There are also, the well documented, and very practical disadvantages, but what’s the point of whining about that? I’ll leave that to the newly poor. But compare me to the average guy my age, at my level of education (not necessarily in my field), in my city. I’m WAY below average. I’m pretty close to poor. But here’s the thing: Thanks to the recent economic dilly-oh, a lot of those guys lost millions and millions of dollars. I didn’t. That means the disparity between us has closed by millions of dollars. Its like I just MADE millions of dollars. One of the things about living in a city where there is a lot of television and movie production is that one comes across a “shoot” from time to time. I’ve been riding my bicycle up and down Riverside Park between my place in Washington Heights and the SITI Company office/studio in Midtown. Riverside Park is often a location for shows like “Law And Order” which shoot here in the city. So yesterday, I’m riding downtown through the park and I see a “Law And Order” location shoot going on up ahead. Now usually this isn’t a problem because they either just let you go through or the most you have to wait is the span of “a take”. But as I got closer, I realized that the pathway was completely blocked by what looked like regular ordinary crime scene tape. Looking around I suddenly realized that there were no cameras or lights. It took way too long for me to realize that this was an actual crime scene, and these were actual cops. I’ve always had this conception about Manhattan that an important part of it’s dynamism, arises from basic design characteristics. On the most basic level, this comes down to, the compression of being an island, balanced by the big hole in the middle (Central Park). But moving one level closer, the most interesting characteristic to me is that the grid that forms most of the island is sliced diagonally on it’s long axis by the avenue known as Broadway. The places where the diagonal crosses other North – South avenues become complex intersections with a park (Washington Square) or a high concentration of activity (Times Square). Also given that the rough history of the city begins on the southern tip of the island and moves north, Broadway traces time as well as space. I’ve always had this idea about making this observation experiential by walking the entire length of Manhattan island along Broadway. From Battery Park to the Harlem river. So yesterday, I did it. It took five hours to cover the thirteen miles, with occasional stops. I stayed on the East side of Broadway the whole way. I know that one of the reasons why I did this now is that I was just in Boulder Co. for five weeks and I did a lot of hiking there. The primary feature that I was hiking on and around in the Front Range of the Rockies outside of Boulder was the three big rock cathedrals known as “The Flatirons.” It didn’t hit me till I was right there, but at one point yesterday I looked up and started laughing. I was looking at the Flatiron Building. Comparing hiking in Manhatten to hiking in the Front Range, one notes a sharp up tick in the number of restaurants and other commercial establishments. Not to mention people. For a good part of the walk, I was basically walking through a crowd. But the amazing thing is how in five hours I walked through a countless number of micro-cultures. It was like taking a core sample of, not just New York, but America. And if the universal is in the specific then it was like looking at the tree-rings of humanity. Something important in the patterns, revealing a different view of the universe itself. These are the things that pass through the mind. 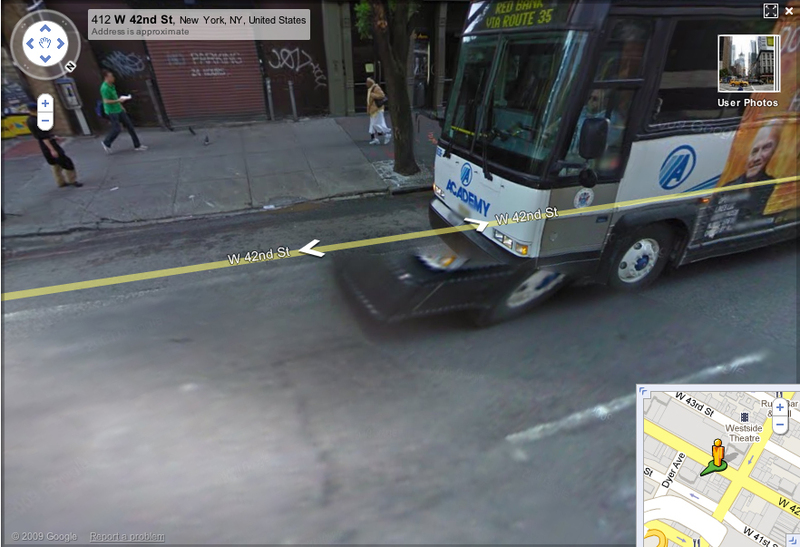 One observation, that stunned me, was how obviously Manhattan is bisected on it’s short axis as well as it’s long. Manhattan below 120th street and Manhattan above it are TWO DIFFERENT WORLDS! I’ve always known this, but it was so clearly and unambiguously palpable. There is a good deal of variety of experience between Wall St, and Morningside Heights, but none of it is as drastic as the shift when you hit Harlem. I want to try to go the other direction some time (and walk the West side of the street), but five hours pounding concrete has left me feeling like someone has been working me over with a ball-peen hammer. I need some time to recover.